Julianna Pena returned to the UFC this weekend after 16 months of recovery from a severe knee injury. On Saturday morning, in Fairfax, Virginia, Julianna Pena did exactly what she set out to do a little over a year ago. After sustaining a devastating knee injury during a practice session in January 2014 — she tore every major tendon and ligament in her knee, a potentially career-ending injury for the rising mixed martial arts fighter — Pena stepped back into the cage for the first time in 16 months. Before she even was scheduled to make her return as an athlete with MMA's biggest promotion, the Ultimate Fighting Championship, the fiercely determined 25-year-old knew she had to make an impression on fans and decision-makers within the organization. Up against Russian fighter Milana Dudieva — who most recently fought and defeated Pena's teammate and training partner Elizabeth Phillips after a controversial judges' decision — Pena was ruthless. She landed a technical knockout in the first of three rounds, finishing Dudieva in a flurry of fists and elbows as she straddled her opponent on the ground. Her win and triumphant return also netted Pena a $50,000 bonus check from the UFC. After the contest, Pena told fans she dedicated the win to teammate Phillips, who was part of Pena's corner support team at the event. When asked what's next, Pena told the crowd she'd be happy to fight anyone the UFC may bring her way. Even during the early days of her recovery when an outlook was less clear, Pena has been incredibly vocal about wanting a chance to knock off undefeated women's bantamweight champ Ronda Rousey, who finished her last opponent in a stunning 14-second arm bar finish. Pena believes she'll have to beat one of the top five ranked women in the class before she'll get the chance to face Rousey. It was an all-around successful day for the Spokane-based Sik-Jitsu team, as Pena's teammate Mike Chiesa (12-2) bested Canadian fighter Mitch Clarke directly after Pena's big win. The 6-foot-1 Spokane native in the 155-lb. lightweight division took Clarke through three brutal rounds to be unanimously declared the winner based on the judges' scores. 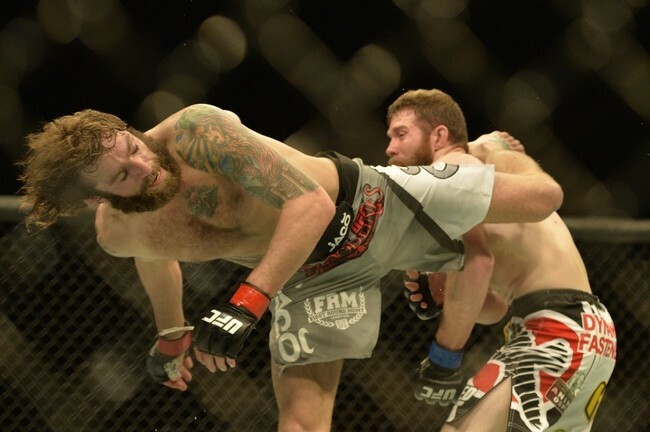 Pena's teammate Mike Chiesa also bested his opponent during Saturday's UFC event in Fairfax, Virginia.